Notice! Grand Kaptan Hotel does not accept reservations at this time. Please try again later. Grand Kaptan Hotel Contact. 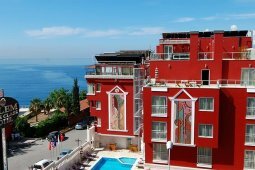 When visiting Alanya, you'll feel right at home at Hotel Grand Kaptan, which offers quality accommodation and great service. 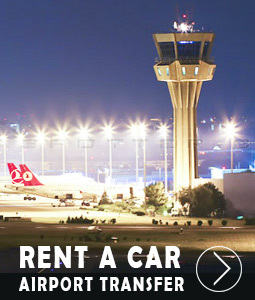 Only away, this 5-star hotel can be easily accessed from the airport. With the city's main attractions such as tour boats, Red Tower Brewery Restaurant, Red Tower within close reach, visitors to the hotel will just love its location. Hotel Grand Kaptan offers impeccable service and all the essential amenities to invigorate travelers. The hotel offers access to a vast array of services, including 24-hour room service, free Wi-Fi in all rooms, 24-hour security, convenience store, daily housekeeping. Step into one of 334 inviting rooms and escape the stresses of the day with a wide range of amenities such as television LCD/plasma screen, additional bathroom, additional toilet, bathroom phone, cleaning products which can be found in some rooms. The hotel offers fantastic facilities, including hot tub, private beach, fitness center, sauna, outdoor pool, to help you unwind after an action-packed day in the city. With an ideal location and facilities to match, Hotel Grand Kaptan hits the spot in many ways. Grand Kaptan Hotel accepts VISA and reserves the right to temporarily hold an amount prior to arrival. Grand Kaptan Hotel accepts Master Card and reserves the right to temporarily hold an amount prior to arrival. Grand Kaptan Hotel accepts Maestro and reserves the right to temporarily hold an amount prior to arrival. Grand Kaptan Hotel accepts Bank card and reserves the right to temporarily hold an amount prior to arrival. Grand Kaptan Hotel accepts ATM card and reserves the right to temporarily hold an amount prior to arrival. Free buffet meals in the morning, lunch and dinner. Some local alcoholic beverages and foreign alcoholic beverages and domestic non-alcoholic beverages are free of charge in the Lobby Bar 24 hours. Freshly squeezed fruit juices, imported alcoholic beverages and bottled beverages are charged. Pruvaa la Carte restaurant was booked and paid. The La Costa A la Carte Restaurant is free of charge and free of charge during the stay. The day of the minibar is filled with water, soda, cola and beer and is refreshed daily. Married couples who will benefit from the honeymoon package can benefit from the accommodation they will make within one month from the date of marriage provided that the marriage certificate is shown at check-in. Tesiste has 4 disabled rooms. 2 + 2 or 3 + 1 accomodations in rooms other than family rooms or some private rooms may cause congestion in the room and the extra beds provided may not be comfortable with the fixed bed. The Ultra All Inclusive accommodation is accompanied by an evening meal, includes dinner until the number of nights left, and ends with a breakfast on the day of departure. We are into our second of a three week stay here and so far it has been a wonderful experience, from entering the hotel early hours we were soon booked into our room which is perfect. The meals here are of superb quality as is the standard of the staff. Of the many bars, the staff treat you with every care and attention. Wonderful hotel, worth a visit. Loved the food, service and location.